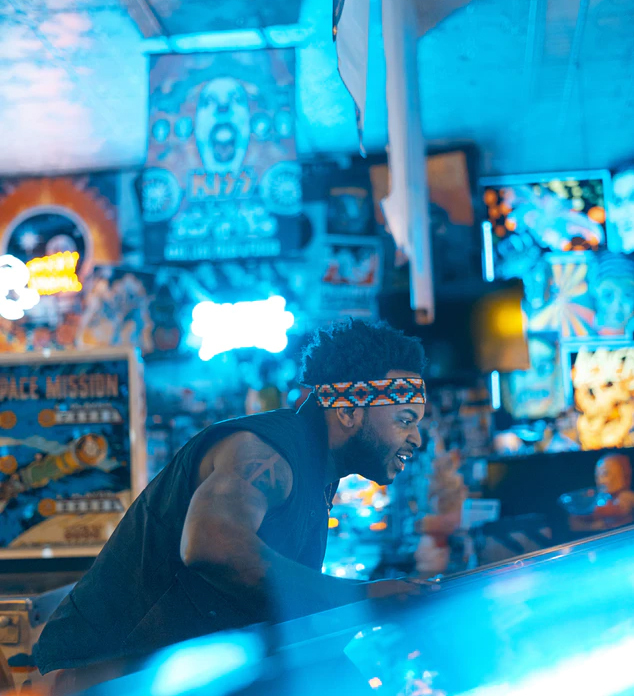 Metro Detroit is now Air Hockey Town and Michigan’s premiere one-stop game room shop, Game Room Guys, is providing all the fast-paced action and fun! Game Room Guys (Grand Rapids, Livonia) specializes in high-quality game room games, accessories and more! Air Hockey is a classic game room game that almost anyone can play! Simple, fast, loud and fun, air hockey is great for entertaining guests of all ages, with up to 4 players competing at once. There is something about the hum of the motor, the click-clack of the puck and the slam of the puck when a player scores a goal that gets people excited when playing air hockey! Air Hockey Tables are fairly simple when you break them down: A porous, smooth flat surface, 2 goals, 1 puck, 2 mallets, 4 rails and a blower motor. That’s it…ok, ok there are some legs and possibly a scoring unit, and a multitude of bells and whistles, but you get the idea: This is a simple game that provides hours of entertainment. you want to buy. Make sure you have at least 36” on each end of the table for players to maneuver. Any less than that and things start feeling cramped. The more room you can give players to move around the more fun they will have. Also measure the height of your location, overhead scoring units not only look great but can add some much needed lighting to your area. Secondly, if you’ve ever played a game of air hockey you know how fast and intense the games can get. When you are comparing prices and models, remember that these game units should be designed to take a beating. Pay special attention to the detail of the construction. Look for things like solid legs, corner braces and a table top that looks like it has some form of protective barrier on it. Inevitably drinks will be spilled, people will get overly-excited by the intense action and you want to make sure your table can stand up to the years of abuse. 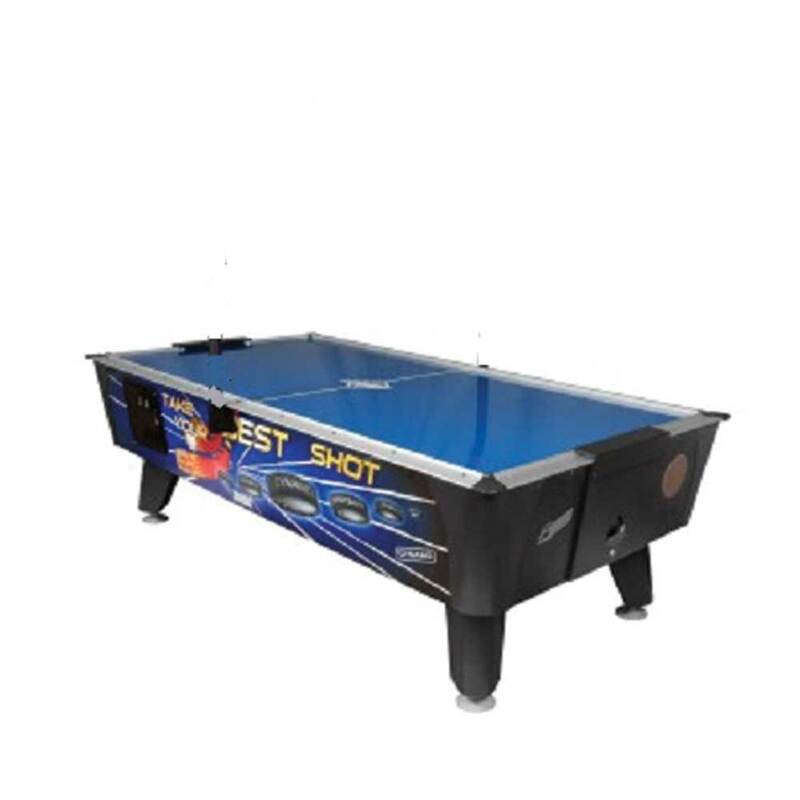 At Game Room Guys we stock only Air Hockey tables that we know will provide our customers with years of quality family friendly game room fun. 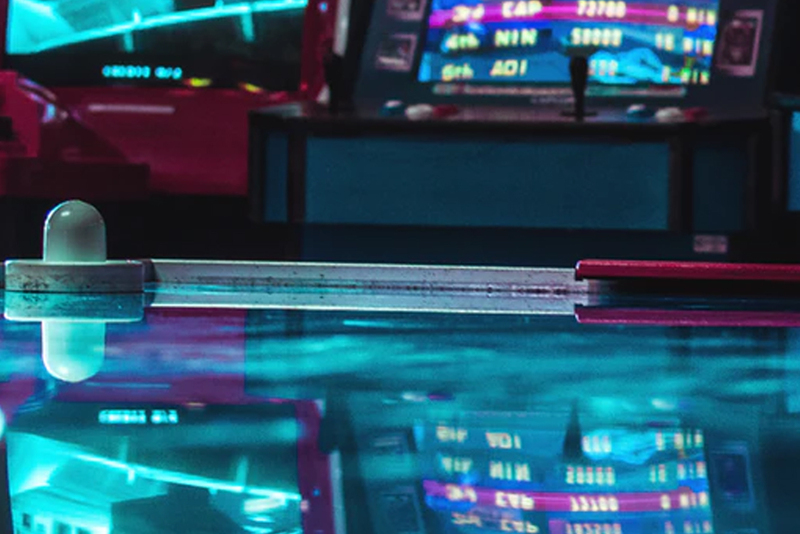 Take a look at some of our best-selling, high-quality air hockey tables to get a feel for which one might fit your needs best! A stately appearance and sturdy wood construction make the Dynamo Pro Style 8' Air Hockey Table one of our best sellers! The design features tapered sides so players can get even closer to the action and make those crucial saves and lightning-fast goals. Exclusive Dyna-Blast blower system provides powerful and reliable performance that distributes the air evenly through-out the table surface for unparalleled puck stability and game play. The side-mount LED scoring (over-head lighting option available for an additional cost) displays player’s scores that are easily readable during matches. Table automatically tallies goals as they are scored and displays them in bright, crisp, red digital numbers. Heavy-duty polystyrene legs with heavy-duty leg levelers ensure that this table will be level in any room and can handle the intense action that is sure to unfold on its playfield. The solid construction continues with the commercial grade cabinet and aluminum rails that provide fast deflection for even crazier air hockey action! Easy to learn and even easier to operate, owners simply plug into the nearest outlet and press the red button to start the blower motor and the fun begins! 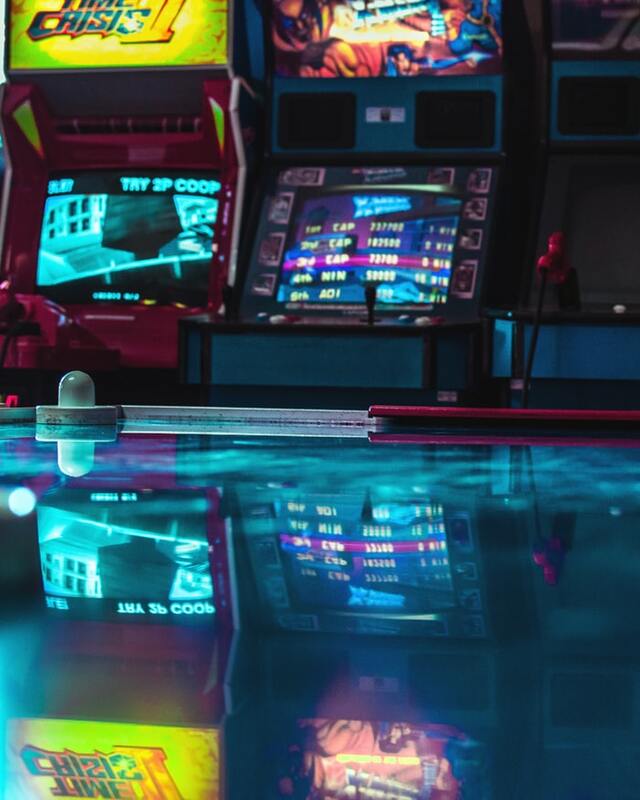 A tank of a game that is built to last and provide years and years of endless air hockey entertainment. Also available in a 7’ model for a smaller footprint and on display at our Livonia Showroom for you to come and play today! The Home Pro Elite air hockey table is where affordability and quality meet. Designed by World Air Hockey Champion, Mark Robbins and endorsed by Danny Hynes and Tim Weissman- both Air Hockey World Champions with over 20 titles between them- this table is backed by some of the biggest names in the industry. with corner braces complete the cabinet and is topped-off with the solid, low-profile, pro-style aluminum rails for superior bankability and bounce. The electronic scoring with sound option automatically detects and tallies your goals. The player’s scores are displayed on the side mount scoring unit that is easy-to-read with its bright, crisp, red digital display. Centerline and face-off circle gives you the perfect spot to start your games and simple operation of a single on/off switch located on the cabinet make this unit so easy to operate, anyone can play it. A great centerpiece to any show room or maybe the start of your hockey-themed man cave, this table brings pro-quality game play to your home at price that is hard to beat! Designed with Tournament quality play in mind, the Best Shot by Dynamo has the features and performance that Tournament players expect and the durable construction that operators demand. This stripped-down commercial work horse skips the lights and sounds, instead focusing on fast action and serious play in a full-size 8-foot air hockey table. The powerful blower motor supports the 3.25” diameter puck effortlessly while providing sufficient air flow for absolutely perfect puck performance and stability game after exciting game. This will make game play that much more fun with the smoothness of airflow providing the air needed for fast-paced air hockey action. The heavy-duty legs are equipped with heavy-duty leg levelers that can be adjusted by one person, for maximum support and a table that can be leveled in any venue. Non-coated aluminum rails provide fast deflection and excellent bounce. Impact resistant Formica playing surface will protect the playfield from premature wear and will make this unit last for countless games for years to come. Equipped with a coin mechanism but bill acceptor ready this unit can be plugged-in and profitable the day it is delivered. Optional overhead lighting unit with integrated scoring and a protective 3-piece shield set are available but the Dynamo durability is standard on every table. Minimal assembly is required to attach the legs and other peripherals. A great game unit that adds excitement to any venue and a sure-fire arcade classic that will attract players young and old to your location. The only thing that is crazier than the awesome cabinet artwork is the gameplay on Batman Vs. Joker: Laughing Madness Air Hockey. Built for commercial use this unit is sure to turn heads and garner attention in any location. This air hockey table has it all: Heroes, villains, non-stop air hockey action and a game-play twist that makes it unlike any ‘regular’ air hockey table. Players can play as either the Batman or Joker and battle for control of Gotham as they try to outscore their opponent on this crazy air hockey table but watch out- the table uses a multi-puck system (much like the one found on the Pac-Man Smash air hockey tables) to release multiple mini-pucks onto the playfield MID-GAME! This creates a hockey puck pandemonium that results in the pucks and players scrambling all over the playfield to try to score goals in the middle of the madness. As if air hockey wasn’t action-packed enough, between the great comic book cabinet art, the multi-mini puck drop system and your lightning-fast air hockey game play, this table is sure to save the day in any location or venue! Great for arcades, schools and anywhere else people want to escape and have some fun! The tables above are just a small sample of the air hockey inventory we keep on hand. Stop into our showrooms or visit our website to see all of your options. Weather you’re just starting or putting on the finishing touches to your game collection, we’re sure to have a table that fits your lifestyle and needs. Looking for Air Hockey Tables in Metro Detroit? Air hockey is a great game that is perfect for nights-in with the kids or having your friends over for some beverages and a few matches. Game Room Guys has all the accessories and equipment you need to make sure you get the most out of your air hockey table. From pucks and mallets to goal sensors and scoring units or any other air hockey table parts you need. Game Room Guys in Metro Detroit carries everything to keep your air hockey running and in tip-top shape for all the years you’ll be enjoying it. Our friendly sales staff loves to talk games and will be more than happy to answer any questions you may have on Air Hockey tables or anything else we carry. We can’t wait to see you and remember: For all your game room needs, we are the guys!